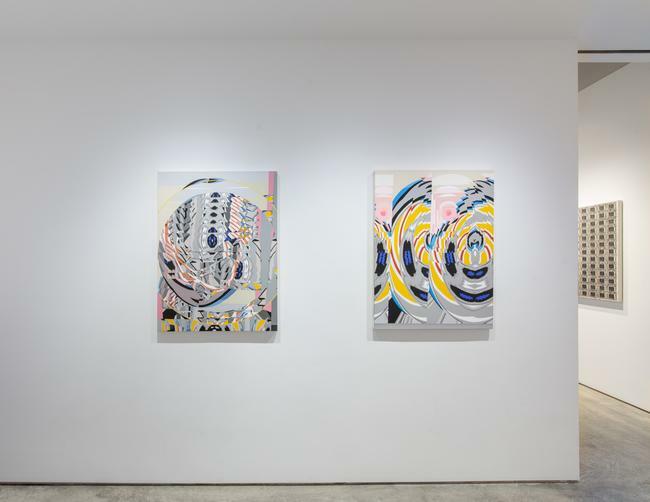 DRISCOLL BABCOCK GALLERIES presents LUIGI TERRUSO: WONDER WHEEL, a selection of kaleidoscopic paintings in which imagery is a momentary stasis between the artist’s memory and imaginings. Terruso’s whimsical and dynamic compositions reference biomorphic and architectural forms, each canvas composed of objects that have been fractured and recombined, undergoing a mechanical metamorphosis. Terruso’s fragmented visual world is inspired in part by his international travels – 18 countries in the past 24 months, including residencies with pop-up studios near Angkor Wat in Cambodia and in a mountain village outside of Cuenca, Ecuador. During this period, Terruso made more than 100,000 photographs that now fuel the prismatic permutations of these creations. The results from this visual feast are nested on these canvases: the frenetic patterns of plastic toys piled high outside the hutongs of Shanghai, rusty industrial refuse orderly arranged on the street in Ho Chi Min City, intricate and delightful stickers and painted designs on long-distance hauling trucks encountered at truck stops in India. In INTERFACE, the artist employs a human form as an imagined character, here evoking traditional portraiture while forcibly expanding its limits. 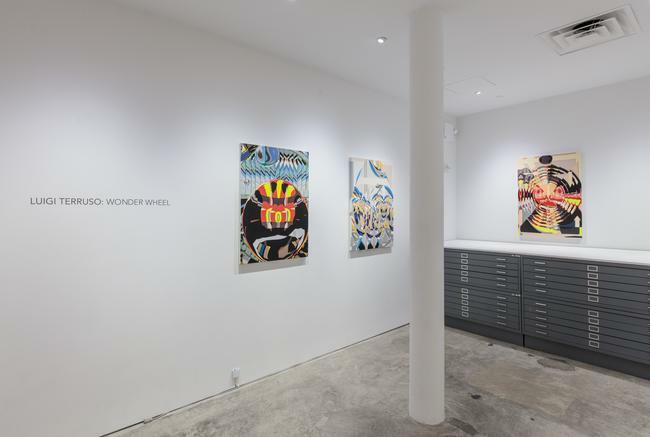 WONDER WHEEL alludes to both the artist’s reverence for the circular form’s ubiquity in organic and created worlds, and the structures of our youth, cemented in memories of adventure, grandiose comic heroes, and whirling carnival rides. Terruso’s inspired images are composed of fractured, abstracted elements, here reassembled in the artist’s own singular language. These painted renderings of deconstructed memories resist orderliness in favor of restrained, playful chaos. Luigi Terruso lives and works in South Kent, Connecticut. Born in Brooklyn in 1964, Terruso began his painting career as a student and apprentice of the abstract expressionists Milton Resnick and Pat Passlof. He received his MFA in 1994 from the Yale School of Art, and has exhibited at the American Academy of Arts and Letters, the National Academy Museum, and throughout the East Coast and internationally. He has been a visiting artist at the American Academy in Rome and an artist-in-residence at the Santa Fe Art Institute, among other honors. 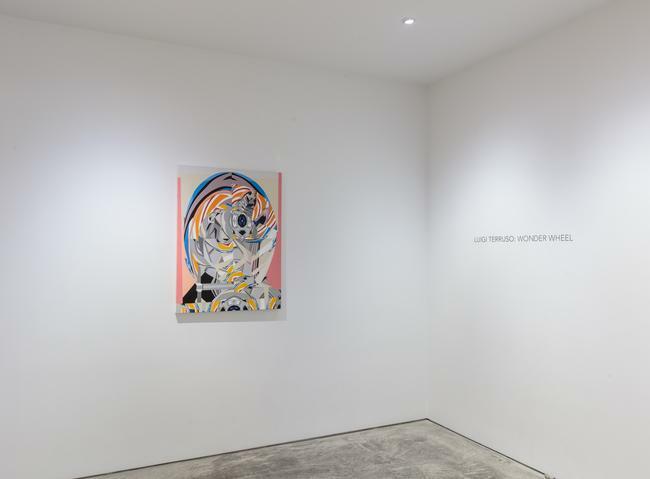 With 42 group and solo exhibitions to his credit, Wonder Wheel is his first exhibition with Driscoll Babcock Galleries. Since 2000, he has hosted twice-yearly workshops for adults with developmental disabilities at his studios in Connecticut as well as in New York City. Additionally, he serves on the board of directors of the Hanoverian Foundation.